I can’t believe Halloween 2015 is here! The year zipped by like nothing, and this last month in particular has been a whirlwind. I love Halloween, but there’s always a sad feeling when the big day finally arrives; the whole month is a build-up to October 31st, and then Halloween itself comes and goes in a quick 24 hours. And just like that, full attention is then directed to Thanksgiving and Christmas. Halloween just ain’t long enough, man. Some readers may remember last year when my Halloween-appropriate output during the season was decidedly lacking. Real life and all that jazz. I have rectified that error somewhat this year; last week we saw Gene Shalit’s visage pitch 1941’s The Wolf Man on VHS, and for this Halloween day post, I’m going above and beyond. 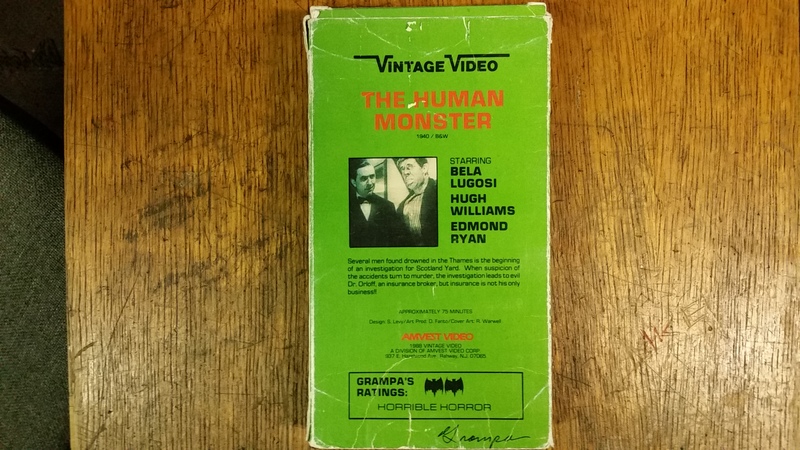 Gene Shalit and Lon Chaney Jr. are a tough act to follow, but I do believe I have accomplished just that, with this: Amvest Video’s Grampa Presents VHS series, starring none other than Al “Grampa Munster” Lewis! 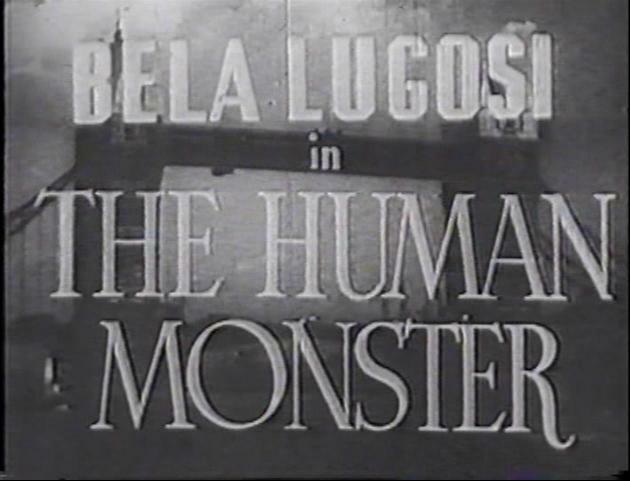 And he’s hosting Bela Lugosi’s The Human Monster! Cool winnins! 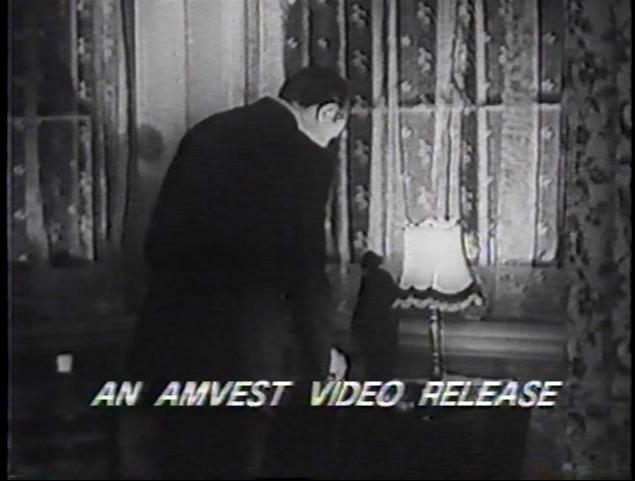 There were a bunch of these Grampa Presents videos for Amvest, though the overall distribution was so limited that no one is quite sure just how many were actually released and how many were merely proposed releases. A good number of titles did make it out of the door in some amount, but none of them are easily found nowadays. Indeed, these releases range from highly obscure to impossibly rare. Heck, even non-Grampa-branded Amvest titles are often tough to come by. Some of these tapes are worth more than others, mostly depending on rarity and/or how cool/popular/whatever the movie featured is. But for those so inclined, enough diligent internet searching should turn up at least some fairly affordable prospects. I mean, these are rare, but not that rare. They ain’t the Honus Wagner of VHS tapes, man. So, when I was able to nab this tape for a price that didn’t cause my arms to flail about in utter dismay, I jumped at the chance. A bit over $20? A little pricey for an ancient budget VHS, but I can live with it. Don’t underestimate just how gratifying it is to finally have one of these tapes in my collection. I’ve been aware of the series for some time now, but the pricing/availability/whatever just never worked out for me. But, I was able to make it happen in time for this Halloween post, and that’s something I really hoped to accomplish. 1) The apparent limited distribution and uncertainty regarding which titles in this series did and didn’t actually hit store shelves, plus the murky aura that often tends to surround these cheapie, dime store video releases in general. It sort of lends an air of mystery to these tapes, and I find that endlessly intriguing. 2) I’m an Al “Grampa” Lewis fan, period. He was such a cool guy, and he never resented the Grampa character typecasting that stuck with him following The Munsters. On the contrary, he took it and ran with it. Besides these videos, there were the personal appearances, television commercials, his own restaurant, even an Atari 7800 game. So yeah, if he’s going to have his own line of VHS tapes in which he hosts public domain horror movies, I’m all over that. And just look at that cover art! If that isn’t budget tape greatness, I don’t know what is. 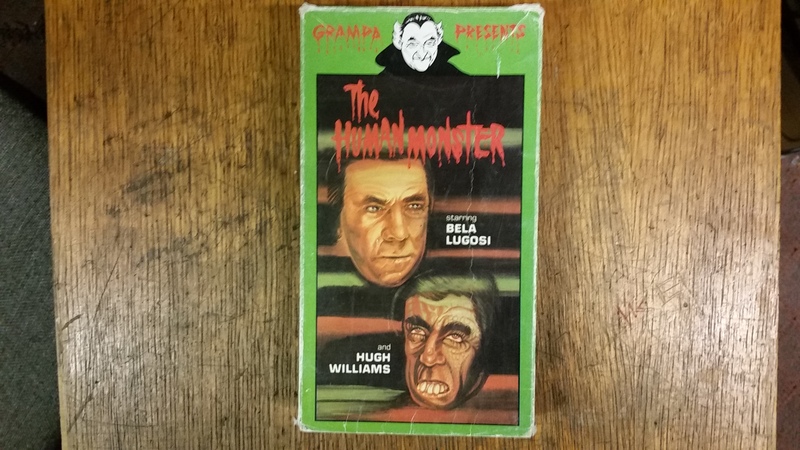 Caricatures of Bela Lugosi and Wilfred Walters (not Hugh Williams as the cover implies), drawn in the proud public domain tape tradition (on cardboard so flimsy I’m actually a little surprised the sleeve has survived to the present day as well as it has), with an illustration of Al “Grampa” Lewis overlooking it all. When it comes to the realm of mega-cheap 1980s budget VHS tapes, it just does not get cooler than that. 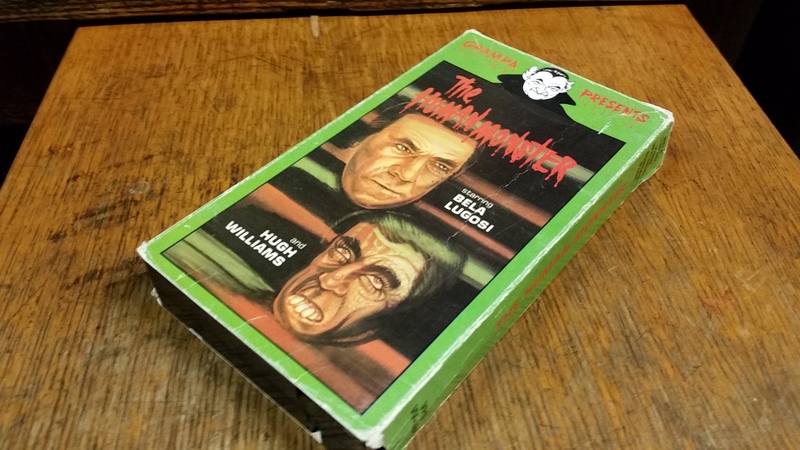 The artwork used for the tapes in the series ranged from “pretty darn decent” (usually the ones that used real photographs or original movie poster art as their basis) to “hilariously amateurish” (many, but not all, of the entries with hand-drawn original artwork), though I’m thinking the illustration for The Human Monster falls somewhere in the middle of that spectrum. You wouldn’t have seen CBS/FOX releasing something like this, but for what it is, a budget video featuring a public domain movie, it’s perfectly serviceable, maybe even above-average. The back cover, naturally. The description is perfunctory, as is par for the course with tapes of this nature (click on it for a super-sized view and judge fo’ yo’ self). What takes this aspect of the release from “meh” territory to “greatest achievement of mankind” territory is the “Grampa’s Ratings” feature at the bottom. Apparently, Grampa gives the film two bats and a description of “Horrible Horror,” which probably isn’t the best way to pitch a prospective customer on your video until you realize you’re supposed to think this was Al Lewis himself giving his seal of approval, in which case how good or bad the movie is is almost secondary to the mental picture of Grampa sitting down and critically analyzing it. I wonder if Amvest actually did solicit Lewis’ opinion and those are his own real words on the back? I can easily see it being a gimmick the marketing department (?) cooked up to add some extra allure to the tape, but I can just as easily see Lewis matter-of-factly stating his opinion. “It’s hohrrable horrah, Hoyman!” That was my attempt at an Al Lewis-style New York accent, though it probably doesn’t work in print as well as I hoped. Just play along here, okay? The tape itself, featuring the plainest label and cheapest film reels in the universe, as well as approximately 3 feet of actual video tape used total (make note of this fact; it will come back to haunt me later). Al “Grampa Munster” Lewis! Look at him up there. What a badass. 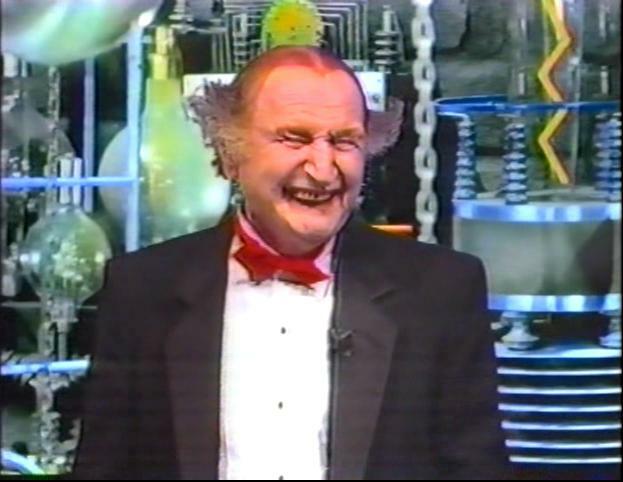 Like I said before, I’m a huge Al Lewis fan, and seeing him doing his Grampa shtick in any format is a pleasure. But, when that shtick entails horror hosting, man, that’s directly up my alley. 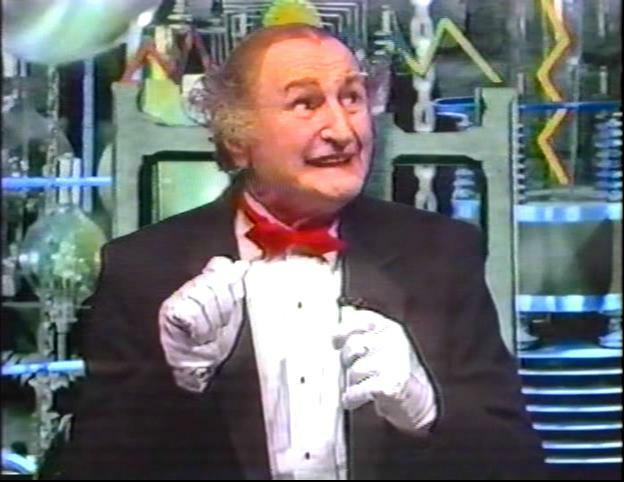 On that front, these Amvest videos not only feature Lewis hosting a movie, they were also released in 1988, which was smack in the middle of Lewis’ run on TBS as host of Super Scary Saturday, a weekend showcase in which he hosted horror and sci-fi films as his Grampa persona. Back in June, I looked at one such broadcast. By ’88, home video was a genuine fact of life, and by then it had progressed to the point where it was actually feasible to have budget tapes. Considering Lewis wasn’t shy about lending his Grampa-persona to anyone willing to pony up the bucks, his TBS show was doing well with the kids, and Thriller Video had some success with Elvira hosting movies-for-video, it makes total sense to try to get in on some o’ dat. Heck, this sorta feels like an attempt at aping Thriller’s Elvira videos, only more cut-rate and kid-friendly. 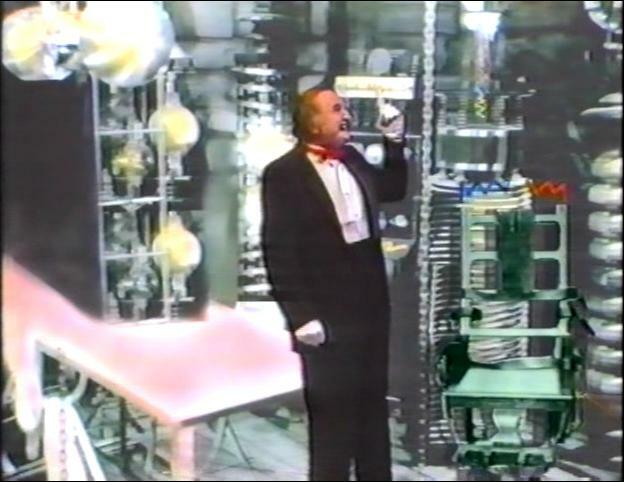 Those used to his Super Scary Saturday set and its expansive “mad scientist lab” set-up are in for a bit of a shock here. A ‘real’ lab set is nowhere to be found; instead, a green screen featuring a stock shot (I guess) of a lab, with added tinting and neon-squiggle accents (hey, it was 1988), is used for this endeavor. It looks, well, it looks kinda rinky dink, but Amvest was a budget outfit, and after shelling out the Grampa-bucks, you do what you can afford. The setting may be a low budget affair, but his dialog is classic Grampa. Really, I can’t see how anyone couldn’t love the guy. He opens with a joke about viewers mistaking him for Paul Newman (note: he’s not), and then makes specific mention of personally watching a movie from Amvest’s film library with you, the viewer. Since these tapes were almost certainly aimed at kids (for the most part; there’s a couple more-intense films sprinkled throughout), his patter fits perfectly, and he (obviously) had his act down to a science by that point. So even though it isn’t/wasn’t a high-end setting, it all still works wonderfully, and it’s all to Lewis’ performance. And really, while my feelings may be slightly skewed because this is Halloween day, this all just feels like the kind of tape parents would put on for kids that were too young to fully partake in Halloween activities but still wanted to give them something ostensibly spooky to stare at. I love it. By the way, there was an opening sequence to all of this wackiness, but as was the case with so many budget videos, there was no customary blank black screen or copyright notices prior to the start of the show/movie/etc. The program itself started at the very beginning of the tape. Problem with that set-up is that when it comes to tapes of this nature, that’s when tracking and whatnot is still getting situated, and as far as this tape goes, by the time things settle down to a coherent viewing-point, Grampa is already into his pitch. This irritates me. Rumor has it that these intros and outros were the exact same for every Amvest Grampa Presents release, with only a voiceover changed to reflect the different films featured. That is, Grampa would ask the unseen Igor what the feature film was for that video, and then look on expectantly as the title was announced via the aforementioned voiceover. Methinks the quality control at Amvest was a little lax, because for this release, they forgot the voiceover! What this means is you get to watch Grampa listening in anticipation to absolute silence and then excitedly proclaiming “That’s the one!” Even for a budget video company, I can’t believe they let something like that slip through the cracks. It’s unintentionally hilarious until I remember I paid over $20 for this damn tape. Being wildly public domain, this isn’t a hard movie to track down in the slightest, but oddly enough, until I got this tape I only ever saw the film under the original British title of Dark Eyes Of London. But, it didn’t. Even this latest viewing did little to change my opinion that it’s a slow-moving, dry, overtly British film. Not that I mean to knock British films, there’s a ton of great ones even from just the same time period as this, but British horror and sci-fi has just never appealed to me the way similar U.S. products in the genre(s) have. It may be anathema to admit this, but even the Hammer films have never really tripped my trigger. And Gorgo? A less fun (and overrated, in my opinion) Godzilla knock-off. In fact, Vincent Price’s Theatre Of Blood has been the only British film in this genre to genuinely, raptly hold my attention. So, hey, I know this won’t be a popular opinion, but I’m being honest: I find The Human Monster infinitely less fun than Bela’s The Ape Man, Invisible Ghost, or what have you. And, I know I’m probably in the minority there; a lot of people love this movie. That’s fine, I don’t want to stomp around babbling about how bad it is or anything like that, but frankly, it just doesn’t do much for me. You know, I realized that as of late this might as well be the “Bela Blog.” Over the past year, he’s popped up here via Superhost’s Dracula broadcast, Son Of Ghoul’s Plan 9 broadcast, my SPN Network post, even that recent Mill Creek movie set review and just last week in the previously-linked Gene Shalit Wolf Man VHS post. Even a few stray times beyond all that, too. Bela definitely has a presence here. This wasn’t a conscious decision on my part, though. 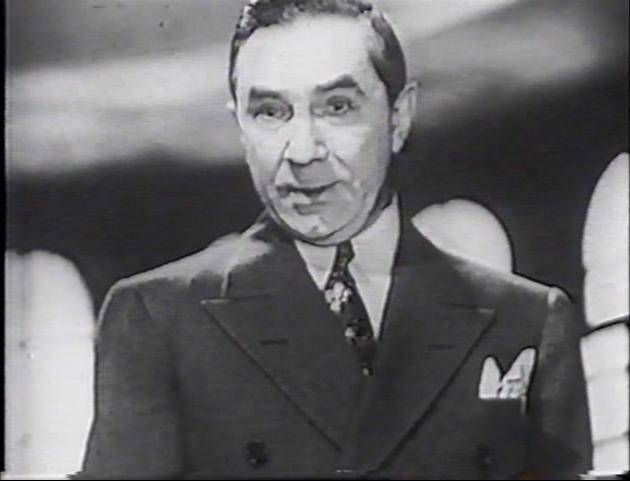 I can only write about what I’m sufficiently fired up over, and it was sheer coincidence that Bela Lugosi figured into so much of it. Not that I’m complaining; I’m the first to admit I’m a big fan of his. Bela, Boris Karloff and Vincent Price – if a movie features them, it doesn’t matter how good or bad it is, their involvement is enough to garner at least some interest on my part (The Human Monster included). Such is my admiration for them both as actors and as a horror/sci-fi junkie. In this one, Bela plays one Dr. Orloff, an insurance salesman that kills clients for their policies and then collects the big money. Probably not exactly a foolproof plan, but no one ever said evil guys are always rational. Orloff also masquerades as a fella named Dearborn, who runs a home for the blind, a locale that figures prominently into the plot. I think a large part of my lukewarm feelings towards this movie stem from the fact that it just isn’t very “horrific” in a typical-of-the-genre sense. Bela doesn’t create any creatures, there’s nothing supernatural about it (it’s The Human Monster, after all), and again, I find the proceedings verrry dry. I’ll take Bela turnin’ himself into an ape guy any day. 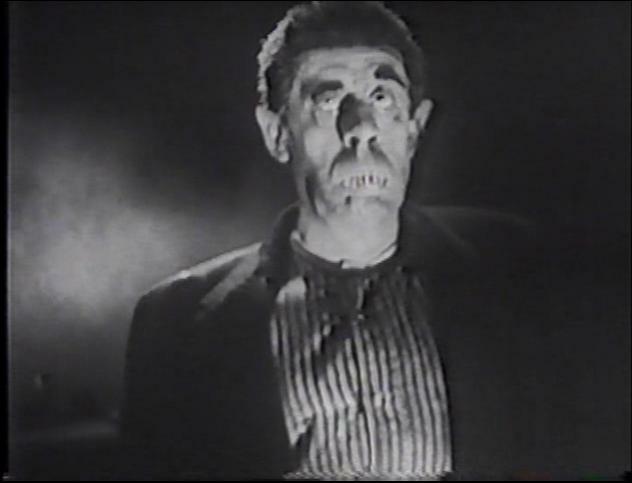 Bela Lugosi’s performance aside (I may not be a fan of the film itself, but he does play his role well), the sole aspect of the movie I find genuinely interesting is Wilfred Walter’s monstrous, blind baddie, Jake, who you’re helpfully seeing above. Jake is a resident of Dearborn’s home for the blind, and does the killing for Dr. Orloff. He certainly does look scary, and to the credit of the filmmakers, there are some terrific shots of him. He doesn’t really save the film for me, but he certainly makes it more bearable. Look at that, Amvest felt the need to watermark the movie at one point, as if someone was interested in stealing their silly lil’ flick. Given that this is a budget video release of a public domain movie, no one should ever expect a pristine film print, and the condition of this The Human Monster certainly lives up (down?) to those expectations. It’s dusty, dirty, scratchy, but yet, thanks to the LP recording speed, relatively sharp and clear. It could have looked so much worse, so that aspect was a pleasant surprise. A decidedly less-pleasant surprise was in store for me though, and it was this surprise that concluded the tape. According to this thread over at the Our Favorite Horror Hosts forum, there was no set recording-mode that these Grampa Presents tapes would be produced in. Could be EP/SLP, could LP (such as this one), could be SP. I have seen pictures of Grampa tapes with an SP sticker affixed to the back (this one here), so SP and LP tapes are definitely out there, and I assume EP/SLP ones were released as well. And that brings us to that eyebrow-raising conclusion: it appears that despite the LP-recording speed used for this copy, there was only enough tape for an EP/SLP recording. You know what that means, don’t you? 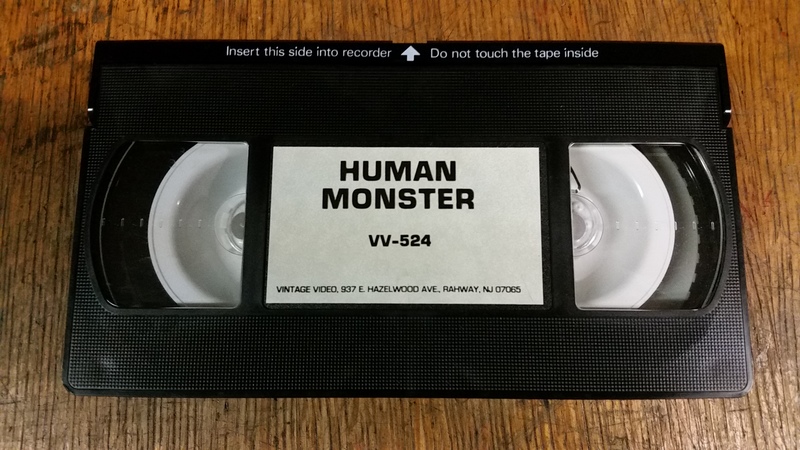 The tape ran out and ended before the actual movie did! That’s right, no stunning conclusion to The Human Monster, and more distressingly, no Grampa outro. My reaction to this revelation was something akin to “AW C’MON!” though I don’t recall my exact words. I wasn’t real happy, though. Don’t let that dissuade you from picking up a copy of this video or any other in the series, though (unless I’m going after it too, in which case kindly back off pal). I doubt this is representative of the Grampa Presents tapes in general; my guess is it’s merely what many would term a “defective video.” Like I said earlier, I’m guessing Amvest’s quality control was a bit lax. I don’t mind discovering this, but I do kinda mind spending $20+ to find out. And yet, in the overall picture, the incomplete recording doesn’t really bother me that much. I mean, yes, of course I’d prefer the whole thing (duh! ), but the rarity of the tape coupled with that perfect slice of late-1980s cheapie VHS essence, that recording snafu is almost overruled by all of that. In fact, it actually kinda adds to that late-1980s cheapie VHS essence! It’s not an ideal situation, obviously, but I try to look at things like this as glass-half-full. I contacted my friend Jesse (one of the most knowledgeable guys I know and a genuine good egg to boot) to see if he remembered these Grampa Presents tapes from back in the day. He did indeed; if anyone would, Jesse would. He recalled that they were briefly (about a year) sold at Rolling Acres Mall (possibly at Camelot) for under $10. In the years since, he’s come across used copies only once or twice, and given the horrid artwork, he didn’t feel compelled to pick them up. That all fits perfectly with what I know about these tapes (which admittedly isn’t much). Jesse gets around much more than I do, so if he’s only come across copies a handful of times at most, their distribution had to be painfully limited. Honestly, even though I personally didn’t have any entries in this video series until this one, it still serves as a nostalgia piece for me. It absolutely reminds me of the budget tapes I had growing up, warts and all. Heck, this just feels like something I would have (should have?) found at D&K in the old State Road shopping center. I never did, of course, but I’d like to think I would have snapped it up with a fervor comparable to what I feel going after these nowadays. Maybe even more fervor back then, because this was all so new to me at the time. I’ve got a lot of tapes. Thousands and thousands, to be frank. When it comes to just the prerecorded stuff, I’ve got so much and have crossed so many personal “wants” off my list over the years that it’s hard to get really, genuinely stoked over a tape. It happens from time to time though, and in the case of not only this tape but all of the Grampa Presents tapes, well, I got the hunger. I don’t care if the intros and outros are essentially the same for each one, I don’t care if the quality is lacking, I don’t even care that this tape doesn’t even play all the way through. The bottom line is it’s Al “Grampa” Lewis, it’s horror hosting, it’s obscure, and it’s just plain cool. I want more, and I’m determined to get more! And with that, this Halloween post comes to a close. Have a fantastic, fun and safe Halloween, everybody! See y’all after Ghoulardifest 2015! 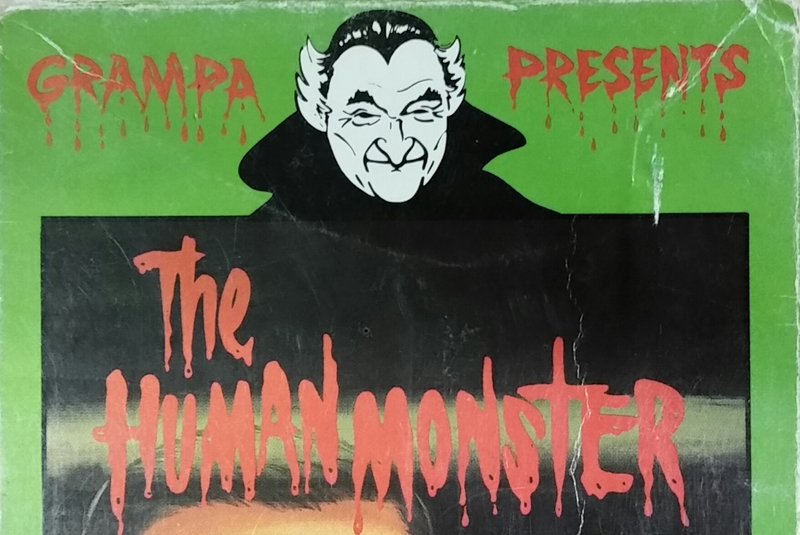 This entry was posted in Uncategorized and tagged 1988, al "grampa munster" lewis, al "grampa" lewis, al "grandpa munster" lewis, al "grandpa" lewis, al lewis, amvest, amvest al lewis, amvest grampa, amvest lugosi, amvest munsters, amvest the human monster, amvest vhs, amvest video, amvest video bela lugosi, amvest video review, amvest video the human monster, article, bela, bela lugosi, bela lugosi dark eyes of london, bela lugosi dracula, bela lugosi human monster, bela lugosi movie, budget, budget tape, dark eyes of london, dark eyes of london 1939, dark eyes of london movie, dark eyes of london movie review, elvira, elvira thriller video, film, flick, grampa, grampa munster, grampa munster vhs, grampa munster video, grampa presents, grampa presents series, grampa presents vhs, grampa tbs, grandpa munster, grandpa presents, grandpa presents vhs, grandpa presents video, grandpa tbs, horror, horror host, horror host film, horror host movie, horror host show, horror host tape, horror hosted show, horror hosting, lugosi, lugosi budget tape, midnight muatnts atari 7800, midnight mutants, movie, munster rare, munster tbs, munsters tbs, old, overview, public domain, public domain movie, public domain tape, rare, rare vhs, rare video, review, sci-fi, science fiction, scifi, super scary saturday, tape, tbs super scary saturday, the dark eyes of london, the human monster, the human monster 1939, the human monster movie review, the munster, vhs, vhs video, video, videocassette, videotape, vintage, vintage video, vintage video amvest on October 31, 2015 by neovideohunter.